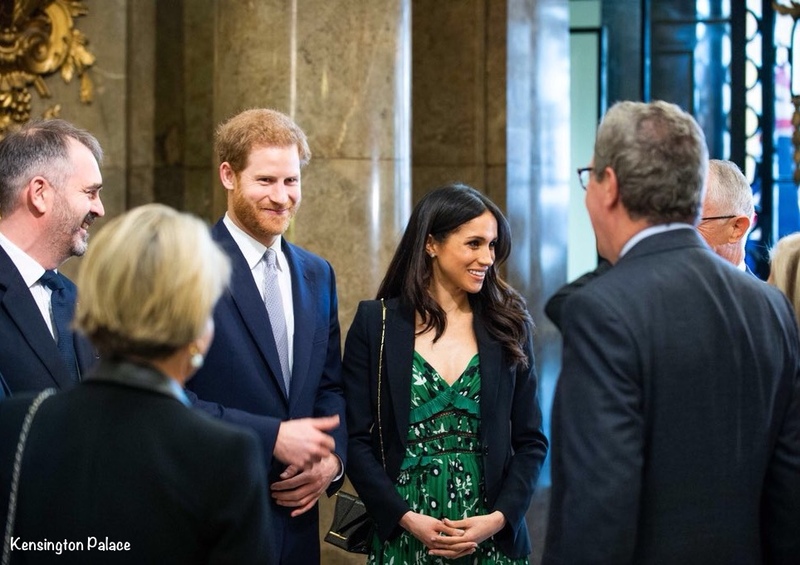 Meghan was in a mix of new and old pieces for today’s visit to Australia House with Prince Harry. 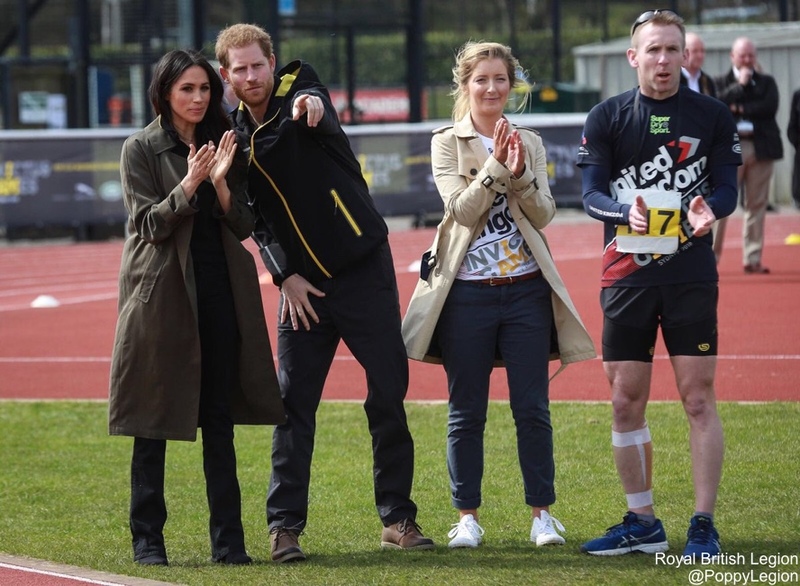 The couple attended a reception and heard an update on this fall’s Invictus Games in Sydney. A video of the couple arriving and being greeted by Australian Prime Minister Malcolm Turnbull and his wife, Lucy Turnbull. More than 500 competitors from 18 nations are expected to compete in this year’s Games, all of whom are sick and injured military personnel and veterans. 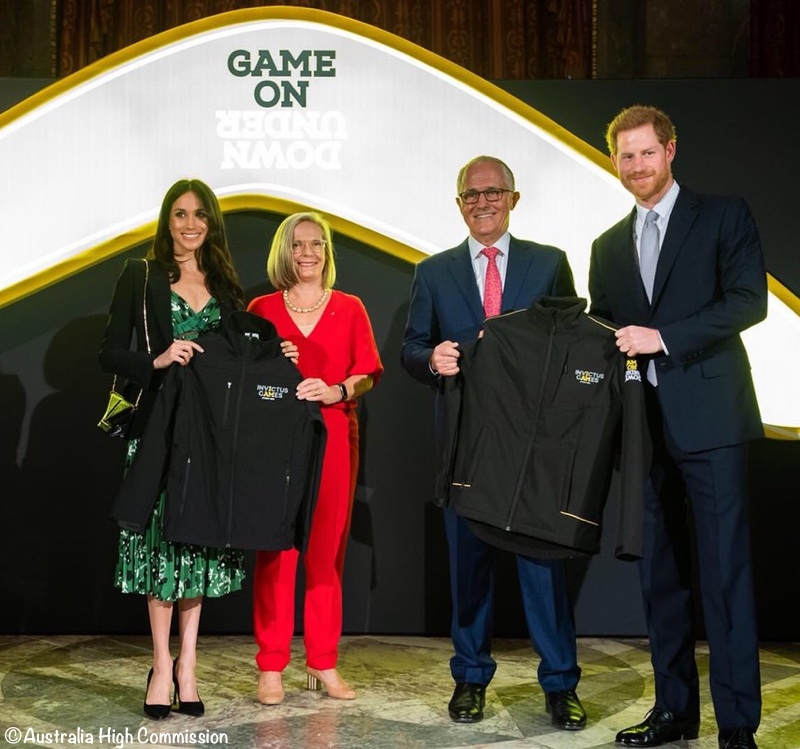 The couple was given official gear for the Sydney games. The Leaf Crepe Jacket is done in an acetate/rayon blend featuring a fitted silhouette, single button closure and slanted flap pockets. 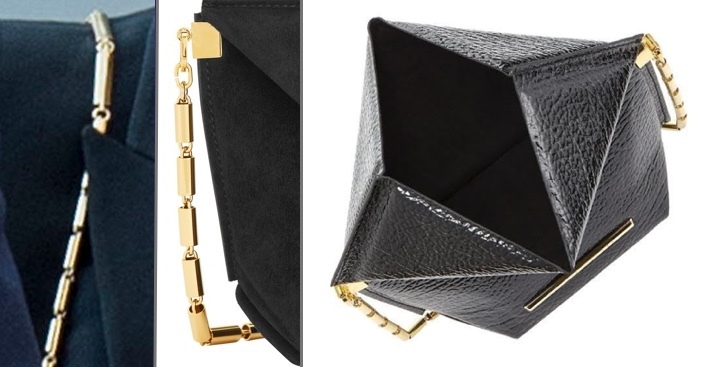 The bag is called either the Mini Classic Origami or the Mini Classico. Meghan’s bag is the shiner patent finish seen on the left, but with the chain shown with the suede bag on the right. Here you see the detail of Meghan’s chain on the far left, and the opened bag, demonstrating why the piece was given the ‘origami’ name. Once again thanks go to Michelle of Perths Fashion for her speedy bag identification! 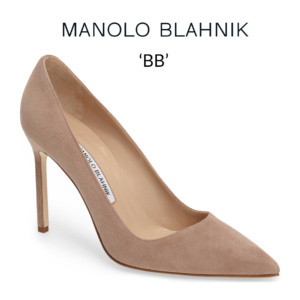 Meghan was in her Manolo Blank BB heels in black suede. 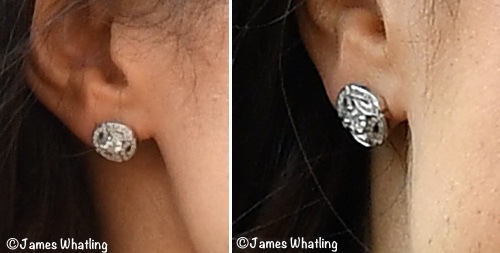 We are still trying to identify her earrings, they are not a pair we have seen previously. 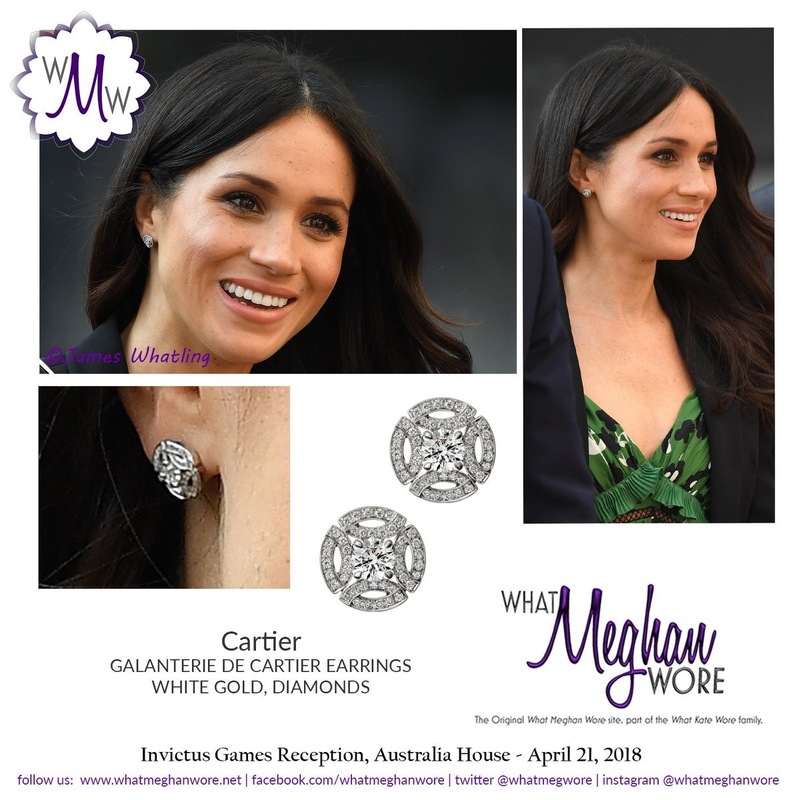 UPDATE APR 22: We believe Meghan’s earrings could be by Cartier. 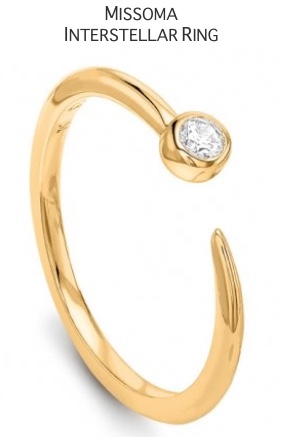 They appear to be the jeweler’s Galanterie de Cartier style. 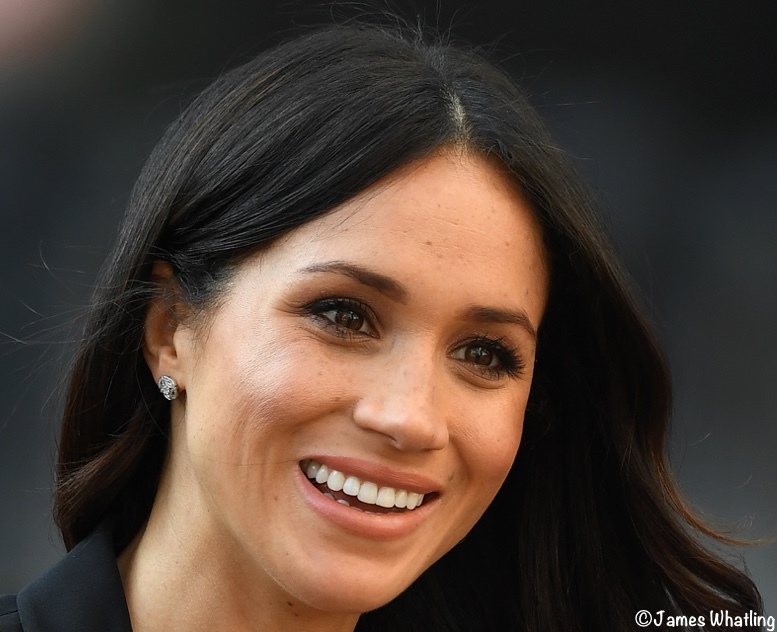 As seen in the photos, Meghan wore her hair down today. A quick reminder that we will be covering the Queen’s Birthday Party concert at Royal Albert Hall tonight. Commemorating HM’s 92nd birthday, it includes performances by Kylie Minogue, Sting, Sir Tom Jones, Alfie Boe and Shaggy, as well as a special tribute by Prince Harry. Proceeds from the concert benefit the Queen’s Commonwealth Trust; last week it was announced that Prince Harry is President of the Trust. The concert will be aired live on BBC One and BBC Radio 2; it starts at 8 pm local time, that is 3 pm EDT/Noon PDT. 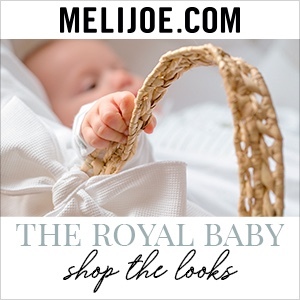 Hello all, I just discovered your site, and enjoy a great deal. I likely have missed the information, but I always wonder who pays for Megan’s clothing now that she is betrothed and in an entirely different social scene. Thank you. This dress is beautiful, and it looks better on her than in any of the other pics. I actually love the way she’s styled it – the midi length, black blazer and black shoes are perfect. I adore this look, especially the juxtaposition of the feminine, frilly dress with the tailored blazer. Her accessories and styling are appropriate for the event and provide enough interest without detracting from the ornate details of the dress. I do (respectfully) have to disagree with the comments that a cardigan would be preferable to the blazer. The ruffles of the dress would have shown through a cardigan and I feel that styling would be better suited to a garden party. 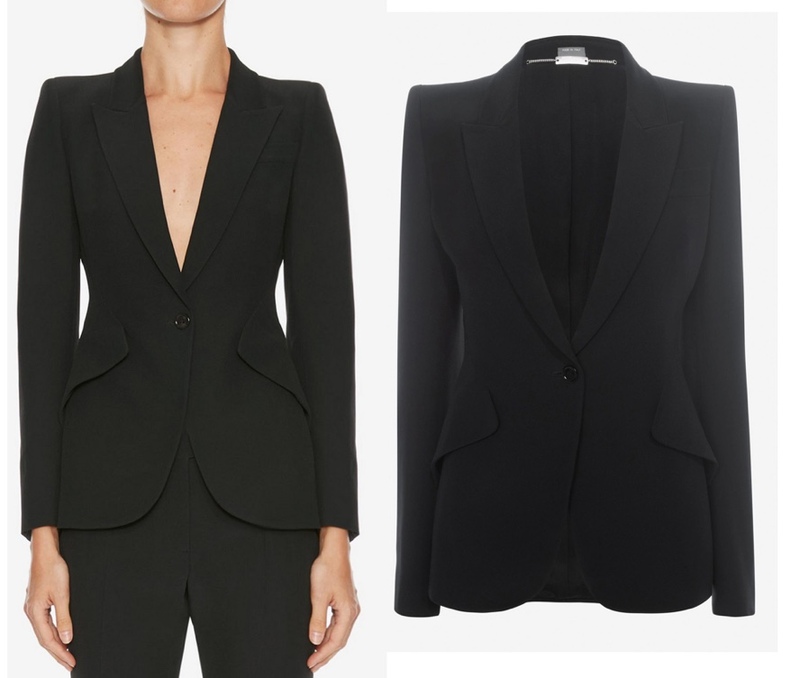 The blazer provides polish and a tailored style that elevate the dress to this occasion. Great post!! Another lovely look, she’s had several hits lately and it’s nice to see – I’m surprised that many wanted to see a cardigan here, since those ruffled sleeves would have looked pretty bunched up underneath. This jacket is one of my favorites of hers, and it looks great next to Harry while also giving her needed coverage for the bodice of the dress. The fabrics here are so nice, and I love the green print. I’m confused at the comment about nasty remarks, maybe they’ve been deleted from this post? 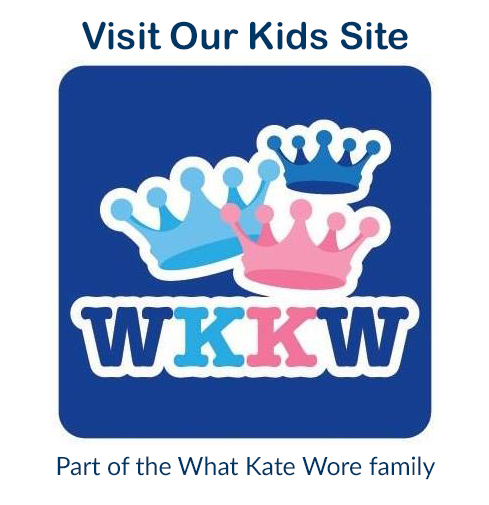 Even those who weren’t wowed by the dress seem to be respectful, maybe an earlier post’s comment section? What a pretty print and a glorious shade of green! The jacket adds enough crisp tailoring to keep this feminine dress professional. I love the pairing of blazer and full skirt. And the patent leather origami bag was an unxpected fun addition. I love the idea of a poll featuring Meghan’s purses/handbags. How will we ever choose a favorite?? A very nice dress and all the better for a a formal event covered up – something Meghan can wear to lunch with her chums. Personally, I believe a green cardigan would have been perfect rather than a blazer, but overall, a nice choice. I love the dress. Hope to see it again without the jacket. Gorgeous colour and style and rocked the event. 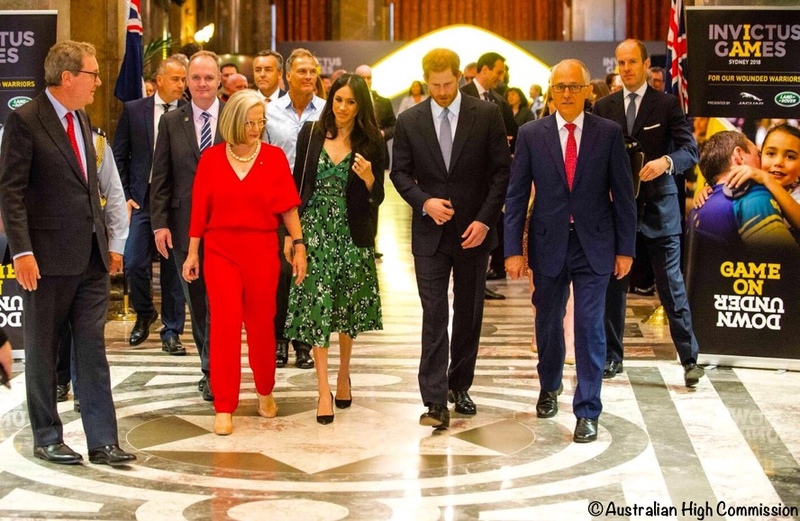 Loved Lucy Turnbull in her red outfit as well. Two amazing women that don’t let their cloyhes define them. I like her look today. The design and color of the dress is fabulous, It definitely says spring, at least to me. In the first full length picture I thought that the shoes were green, I was surprised to see that they are black. Her hair finally looks good and the earrings are spot on !! 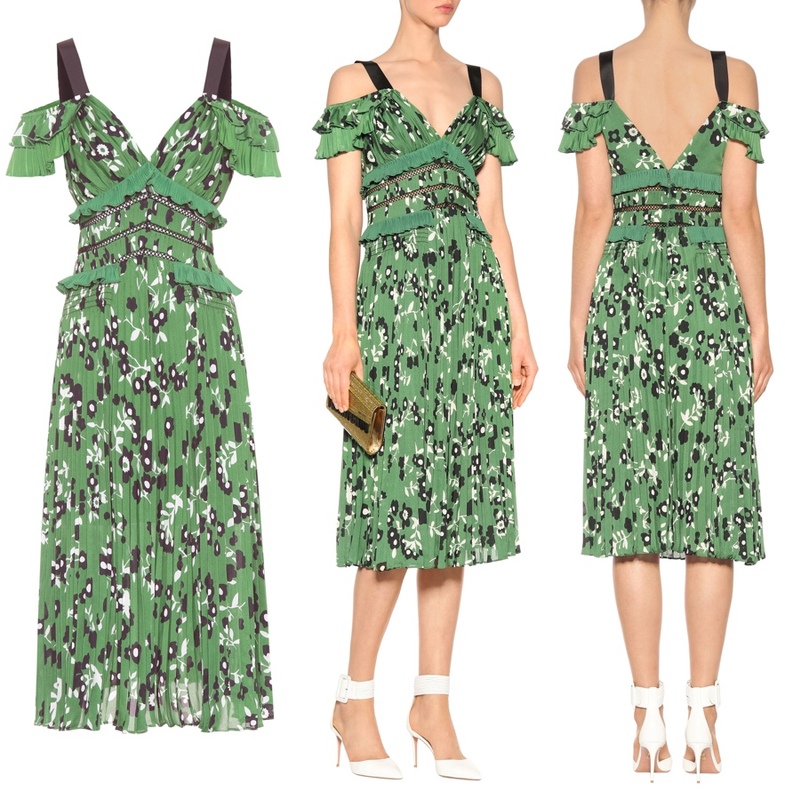 I love the print on this dress, including the beautiful shade of green. The dress with the jacket seems perfect for this event. 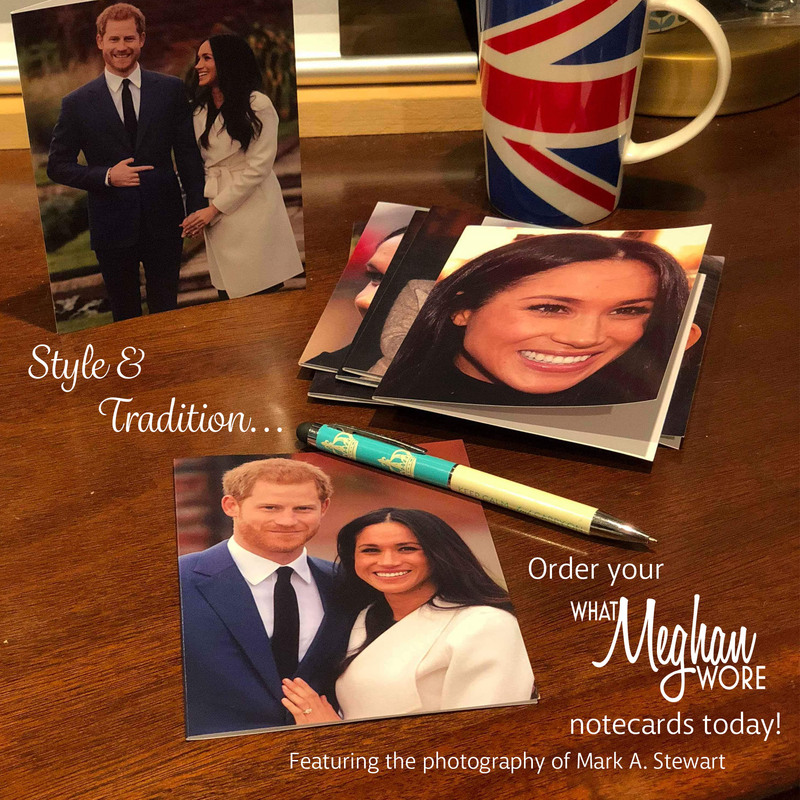 Meghan’s smile is also a wonderful accessory! I like the unique shape of the handbag. A fantastic look overall! Hmmm not sure I love this dress but I don’t hate it as much as the weird looking pinstriped Altuzarra she wore. I like the bottom half of it, if it had been a skirt with a nice blouse and cardigan I think it would have been a great outfit. But I am not a fan of the cold shoulder look (which I was hoping the trend would stay in 2017) and while the blazer is hiding it I think the ruffles are a bit odd. An okay outfit, don’t hate it or love it. Her hair and makeup look amazing and I love her earrings and bag. 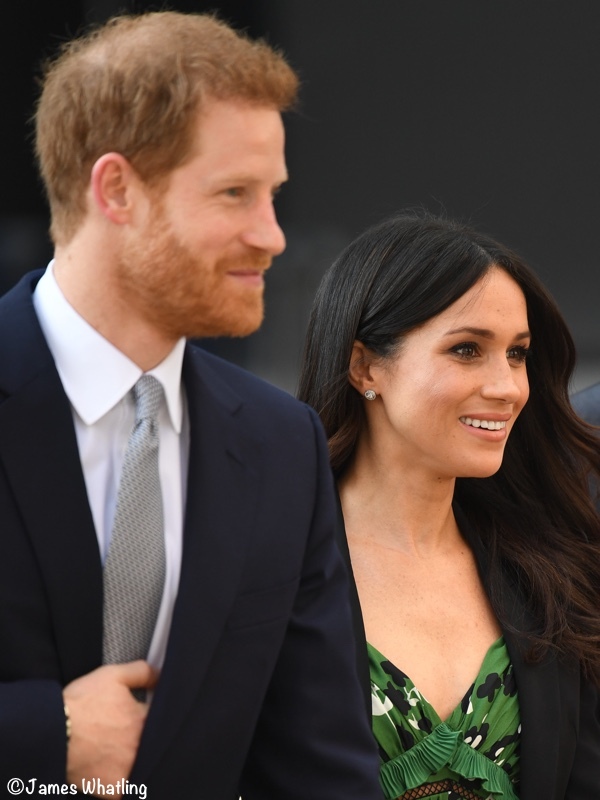 Hallelujah, Meghan finally wore a bright color instead of the grays and blacks she has been favoring. Overall, not a bad outfit. Each piece is very nice individually and not bad together. My only slight qualm is I wished the dress was a titch more formal given that this was an indoor event and Harry was in a suit. I would preferred she save this dress for more of an outdoor event like the tree planting Sophie did at Kew Gardens yesterday or the royal family’s annual visit to the Chelsea Flower show. Overall though, between the Jackie O dress from a couple days ago and this outfit, she is moving in the right direction. 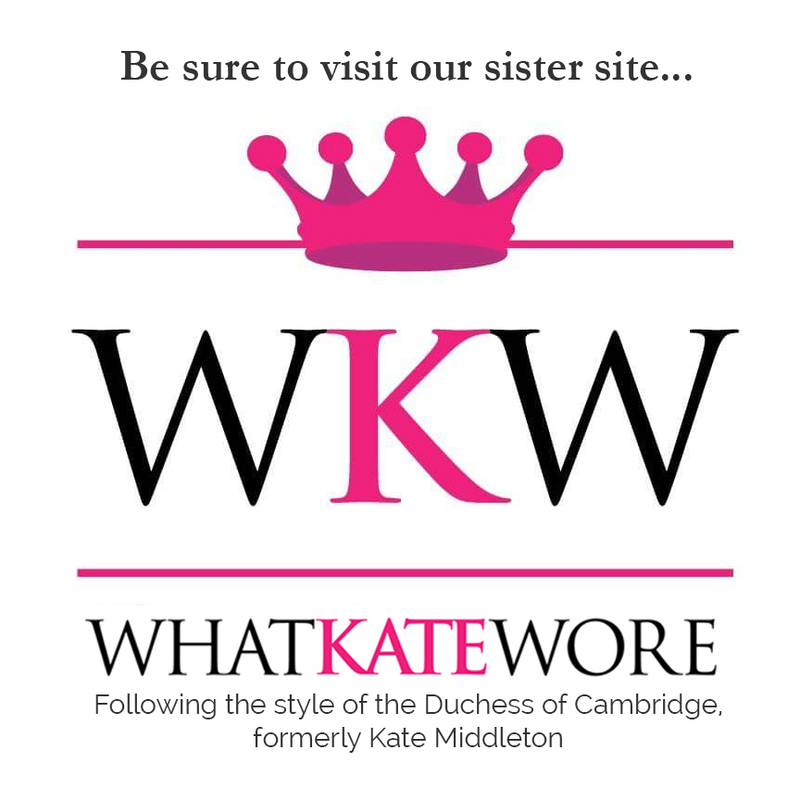 Looking forward to seeing what Meghan will wear to the Queen’s Birthday Concert tonight. 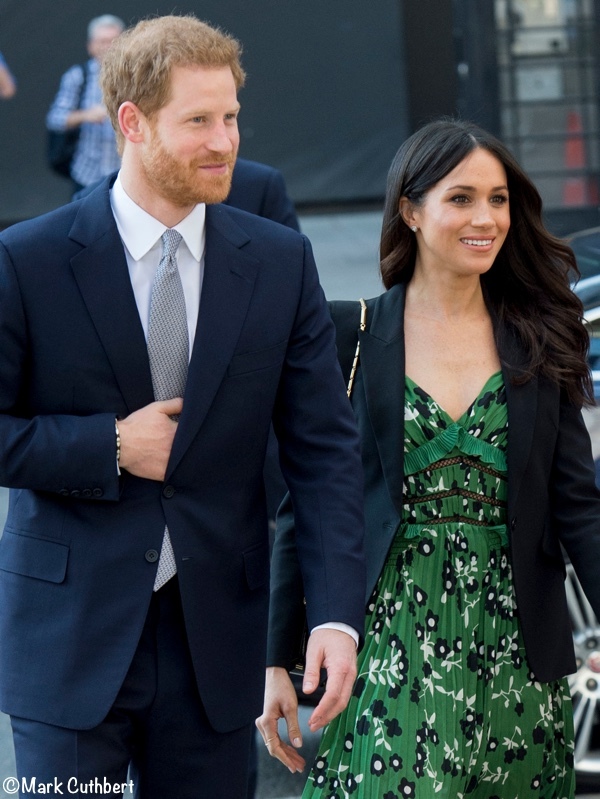 The green looks great on Meghan and it’s fab she is trying out new colours again. I loved the styling of the Halo dress but it was black-again! The royal blue would have been amazing on her. The jacket great with the trousers but it swamped the dress but we can see where she’s going with it. 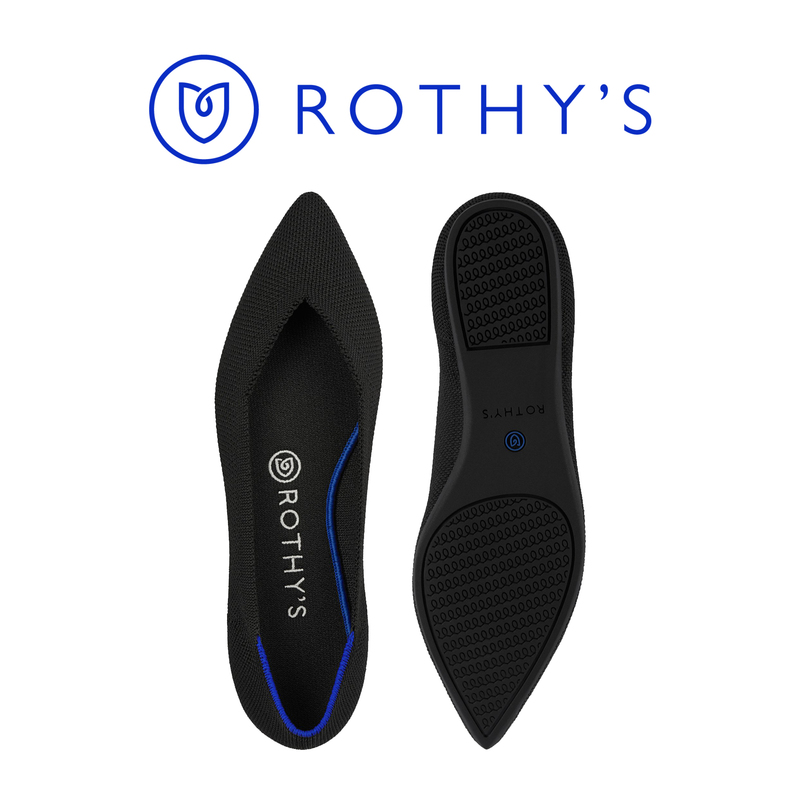 The shoes don’t fit. Overall I think we are getting there with a distinctive but professional look. I love this look! It is the first thing she’s worn since her engagement announcement that actually got me excited. I love it with the blazer! Green is definitely a color she should wear as often as possible. It’s so beautiful on her. I think this is a really nice look. I’m very grateful for that jacket, though, because I don’t like the top of the dress at all and it would have struck me as too informal for her role. But I love the color, the print, the fullness, and the length. Very on trend! She really is the queen of accessories. 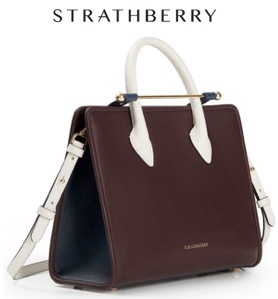 I mean, today her shoes, while lovely, are sort of basic, but the handbag is so distinctive. 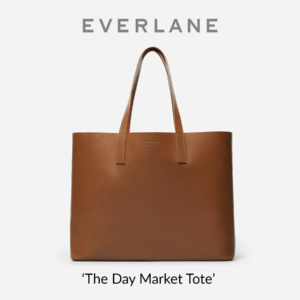 She always has an element like that, which is such a clever way to do do classic dressing–one eye-catching detail. I ADORE the dress she wore this evening! Can’t wait for your post! I adore the color and print of this dress, and I like the ruffle and ladder-stitch details we can see too. There’s a lot going on, but I personally enjoy a frilly, unabashedly feminine dress and this is a great one. However, funny enough, I like it better with the blazer than without. I’ve never been a fan of the cold-shoulder silhouette (though this at least has the option to wear the shoulders up, much better) and I agree with Bonnie that it would have been inappropriate on its own for the event. As she’s styled it I think it’s a great look, professional with a touch of spring, so well done Meghan! Same here! The style is lovely but oh my goodness. Shoes such as those are of taken pictures. I really like this dress, it’s such a nice departure from Meghan’s more neutral palette and I hope to see it without the blazer at some point. I agree with Leah that a cardigan might have worked better as opposed to the blazer, I like the blazer and it doesn’t look bad with this dress but I think a cardigan would have looked better. Like this dress and the way the blazer made it work for this occasion. 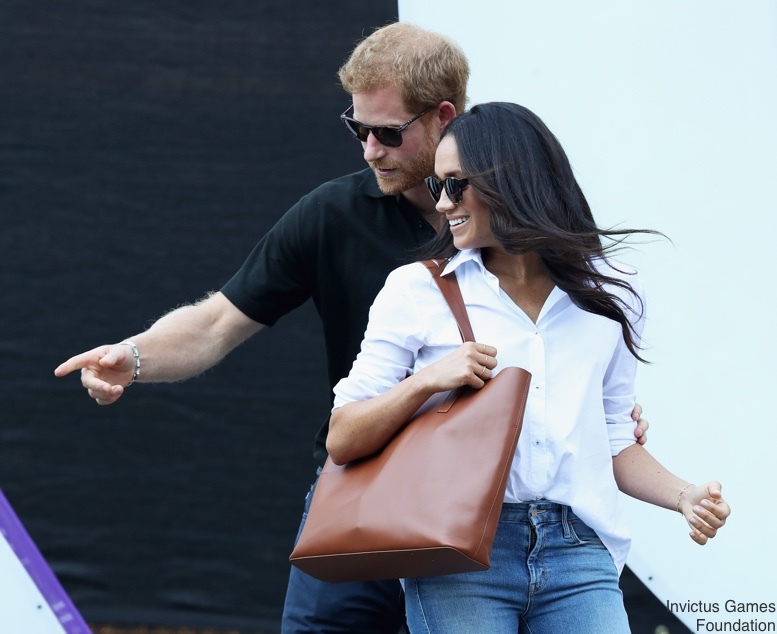 Meghan has an amazing collection of bags. In a few months, I would love to see a post and maybe a poll on them. 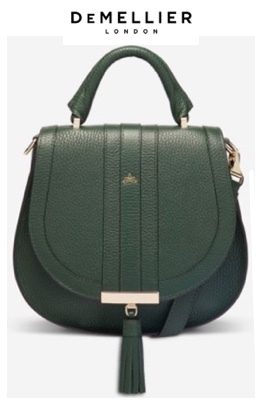 Hi Mallory, what a great idea for a post/poll of Meghan’s purses! I second that motion! Meghan looked beautiful today, youthful and elegant. Reading through some of the comments from the previous posts one would think she showed up in a swim suit:( She was only wearing a sleeveless dress, not flashing no cleavage shown and this was to a youth’s event. Some of the comments are highly inappropriate in my opinion, its one thing to dislike the dress, accessories, but its entirely different to use words like cheap, classless and she doesnt know how to dress. It may not be to your liking but guess what it doesnt make it inappropriate by definition. I’m a 39yr old professional working in an American corporate and this is deemed more suitable. Admin – Its upto you to publish this comment or not, but just want to say that the tone of some of the comments is highly nasty and it takes the joy out of reading this blog. Thank you for commenting Pam, you’re spot-on. We’re referencing the situation in tonight’s post. Cheers to you, Pam. Completely agree! I think a 3/4 length sleeve cardigan or shrug in green might have gone better with the dress. I agree—even a black cardigan would have been better than the jacket. I love the handbag! The dress is pretty with the shoulders worn up but ugly when worn down with the thick straps. I wish she would go for more clutch bags , but overall I liked this look. The striped dress last week was a miss but she is new to this sort of dressing so isn’t going to get it right all the time. Her LBD was spot on ! Thank goodness Meghan wore a jacket, or the dress would once again be inappropriate for the event. Not sure that I like the dress; there is too much going on with it. Purse is interesting and the earrings are pretty.